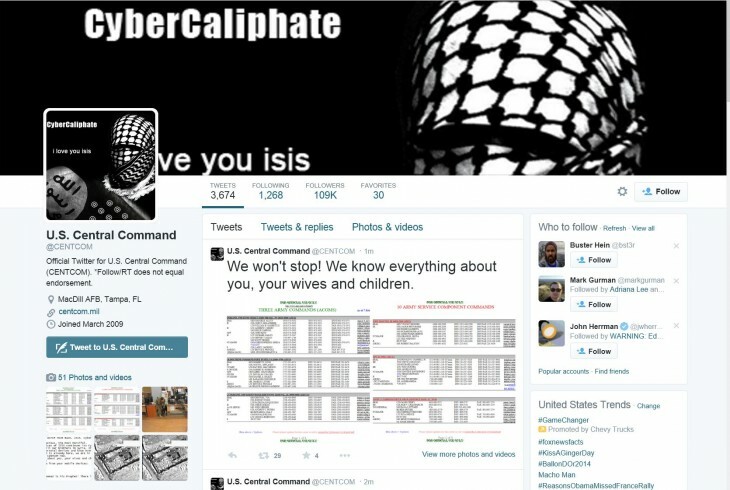 As Obama delivered remarks at the FTC about cybersecurity, the United States Central Command‘s Twitter and YouTube accounts were taken over by hackers going by the moniker of ‘CyberCaliphate’, claiming to be affiliated with ISIS. “ISIS is already here, we are in your PCs, in each military base,” read one of the tweets. A US Official has confirmed the hack, according to NBC News. Meanwhile, the Central Command’s YouTube page was set to display propaganda videos in support of ISIS. The Twitter messages implied ISIS had infiltrated deeper into the Central Command’s networks, and included images depicting what appear to be spreadsheets listing names and addresses of US Army members. It thereafter provides a link to a .zip file labeled ‘US Army Files’, which includes what appears to be lists of names, addresses and contact information for army officers, as well as budget documents from last year. Although ISIS purpot the attack to be a large breach, none of the information appears to be terribly sensitive. A Pentagon official told the Wall Street Journal none of the released data was highly classified. Some of it is readily available on public websites. UPDATE: CENTCOM’s Twitter and YouTube accounts have now both been suspended.